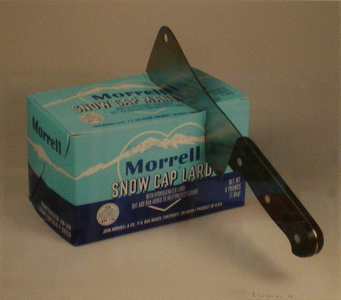 Carl Purcell is a conservative artist. At Palmers Gallery his landscapes hang comfortably (and almost too closely) interleaved with those of Candace Rideout. At the CUAC's invitational Frames of Reference: Images of the Manti Temple, his painterly portrait, a convincing likeness on which brushstrokes and other mannerisms are visible but not obtrusive, shows the building from an angle that omits other structures, allowing it to appear to exist outside time.|0| Except for the personal mannerisms, which compare to handwriting, there is little to distinguish it objectively from another image hanging a few feet away. Purcell approaches the visible world less as a collection of interesting objects to render and more as a collection of boundaries that demarcate spiritually plangent spaces. A church interior and a stony desert landscape are capable of saying the same thing to him. "Transcendent," |1| at Palmers, is a bit of a departure for him, but only a bit. 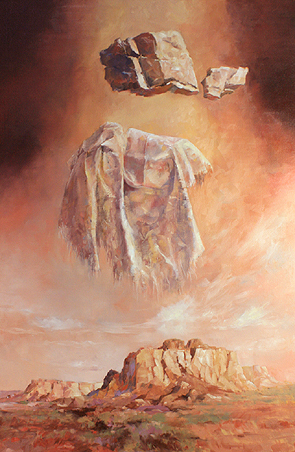 The stone, which he owns, is separated from its source in a sacred landscape by a scrap of cloth, thereby contrasting durable and ephemeral, revealing and concealing, self-possessed and conforming qualities. In action, Purcell approaches places that resonate for him, chooses whether they would be better represented in watercolor or oil, and attempts to capture their visual likeness in a way that pleases the eye's hunger for poise, revelation, and the interaction of exotic and familiar sights. Like Carl Purcell, Ron Richmond paints a range of optical facts that add up to a convincing visual impression. He does not, though, approach things as found, or anything he finds with the thought that if he finds the right point of view his major choice is made. Instead, Richmond actually builds his subjects. For his piece in Snow College's 24/7 show, in which the school's faculty executes works in public over 24 hours, he constructed a wooden framework that he edited out while painting, over which he draped a piece of cloth suggesting a Biblical garment worn by a body of pure light.|2| It's one of a half-dozen or so exercisesone might call them formulasthat he repeats in a tactical search to see how paint, through ever more convincing representation of the visible, can generate a feeling for the invisible and ineffable. A recent addition to his repertoire, visible recently at Snow College and currently at Springville, where he took first prize, is so carefully structured as to be almost mechanical. In these works, he selects a portion of an older painting that appeals to him and copies it. He then places sympathetic subjects in front of his copyceramic bowls and vessels containing various fluids, for exampleand transfers their likenesses onto the canvas behind them. At the CUAC his contribution, apparently one of few painted specifically for this show (painting for a specific purpose is another strategic device some painters exploit and others require) places glass and water in front of part of Minerva Teichert's mural decoration of the World Room.|3| Its the only one of two-dozen works that directly refers to the Temple's interior. 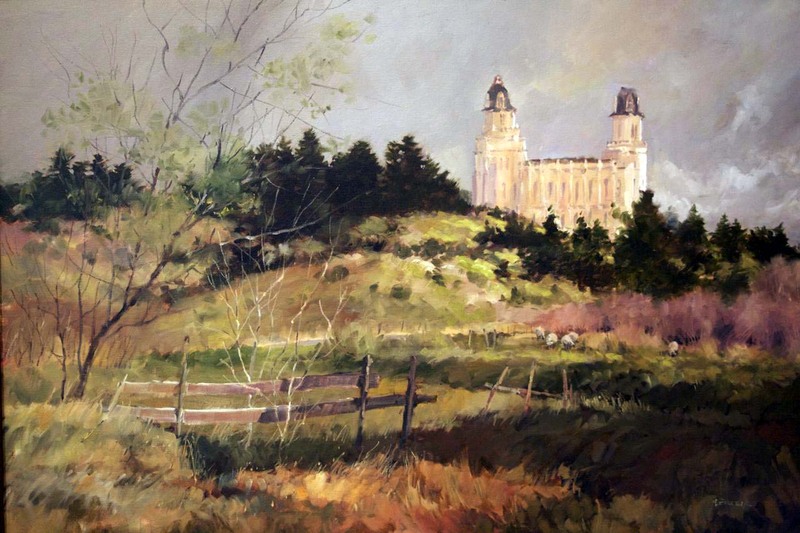 Frames of Reference at the CUAC was curated by Lee Udall Bennion, a widely-admired, predominantly figurative painter recently seen in Utah '08 at the Rio Gallery, and Kathleen Peterson, whose wide range of subjects and appropriate choices of medium can be seen at Phillips Gallery. They invited disparate artists to respond to a single subject, which offers a good chance to compare them directly. Scott Allred, who replaced Carl Purcell as Snow College's painting professor, is a less spontaneous painter. Where Purcell is at his liveliest working in watercolor, suggesting the momentary play of light on a scene, Allred meticulously dissects ephemeral visual impressions in search of the timeless principles that lie beneath. Like many of the works around it, his intaglio, titled "Unique," |4| shows the Temple surrounded by natural vegetation, but his sparse elementssagebrush and an elevated line of sightrecall the continuity of sacred impulses shared by the sites historical denizens. Almost none of these works engages the Temple in its context as one of several hundred buildings that together make up the town of Manti. The one that appears to do so is Sophie Soprano's historical fantasy, reminiscent of one of Thomas Hart Benton’s compendiums of particular American cultures.|5| It’s a deliberate approximation, as delightfully imaginative, but also imaginary, as a Hollywood pastiche. One imagines a musical soundtrack in which the happy villagers burst into spontaneous song. 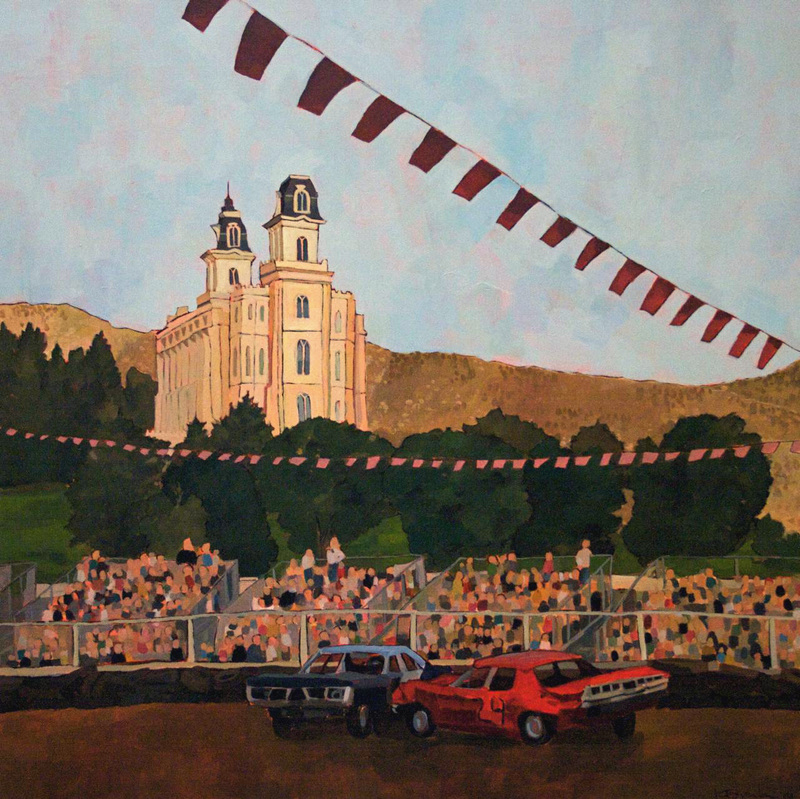 The one image that unambiguously places the Temple in its modern setting is Kelly Brooks' "Demolition Derby w/Temple", in which it dominates the background behind the Sanpete County Fair's demolition derby.|6| Brooks, whose affinity for the church that built the Temple is well known, has adapted her painting strategy over five years or so away from toxics-heavy oils and towards safer materials that are more generally associated with drawing. At the 24/7 show her bravura, contour drawing-inspired, swirling 3D action diagrams continue to explore territory that is hers alone.|7| Juxtaposing them with an accelerated video image of the drawings' subjects, the artist's family, helps viewers connect the colorful drawings to their source and better appreciate their considerable, colorful virtues. "Post Nap Kitchen Clean" exploits some of the tricks she's learned, like prominent drawing and thin layers of paint, which add aesthetic clout to the contemporary feel of her presentation. She probably intendsin any case would not object toa reading of the image that acknowledges how despite the transformation of modern society the Temple remains a valid and meaningful figurehead in its community. A reading of her work that Brooks probably would not support would equate the Manti Temple to a hood ornament instead of a figurehead. Interpretations of a work of art say more about the viewer than the maker, but it's not doing any violence to the Temple to note that the society that created it has seen its creative powers fall off considerably. As the American automobile industry struggles to survive, the once-trivial demolition derby acquires powerful symbolic force. Looking around the Temple, not at (NAME’S) bucolic vision but at the wreckage of Brigham Young's plan for boulevards and quarter-block farms, it's possible to see the Temple as a place apart: a repository of architectural scripture in which is inscribed the best non-verbal expression of what previous generations aspired to say about themselves. As such, there is irony in any attempt to place it symbolically alongside the present generation's conflicted, stressful, and often seemingly heedless life's choices. 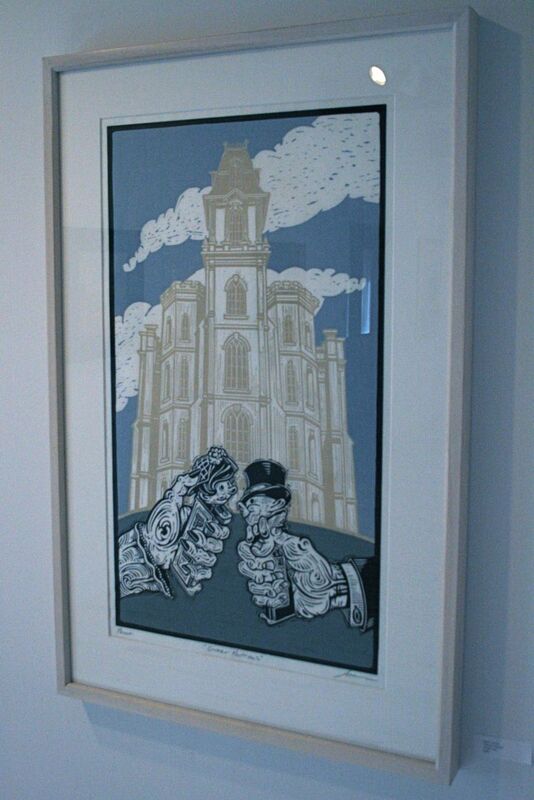 Neither of the two artists who undertake incisive contemporary statements about the Temple is a painter. It would be inappropriate to suggest here that there is anything impious in either, but both risk misunderstanding thereby. Adam Larsen (a former supervisor of this writer) is well known for his interest in children's imaginative lives and their tireless attempts to build a working image of the real world from playthings. In 24/7 he represents the importance of these efforts with imposingly large-scale images of his children's toys, blown up like so many of James Rosenquist's subjects, but rendered roughly to capture their contingent relationship to the child's efforts to comprehend and assign proportions.|8| His contribution to Frames of Reference is a print that uses separate layers in contrasting colors to distinguish two levels of unreality. 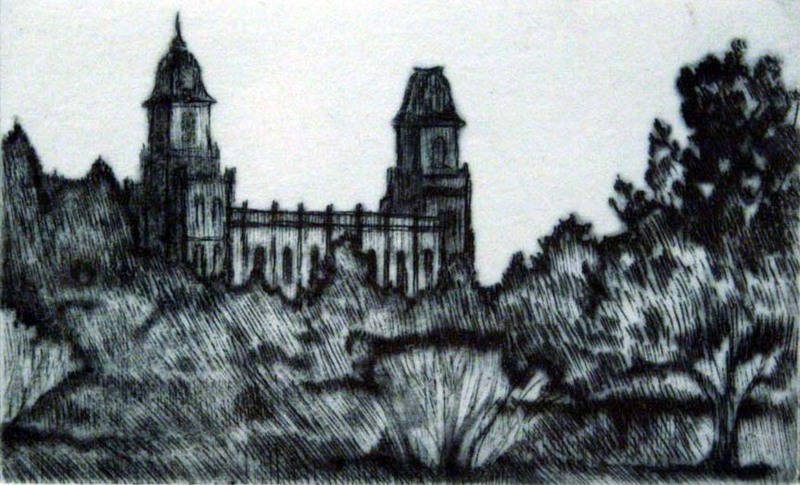 In one, he draws the Temple precisely while rendering it in a manner that idealizes it. Equally unreal, figures in the foreground represent a bride and groom exchanging candy.|9| Larsen always has a point, which in this case is the gateway role of marriage, and thereby of the church’s negotiations, in granting access to life’s “candy:” the adult favors and status markers that follow. A related polychrome print in Cinco de Saltgrass, the independent press’s annual, invitational exhibit, titled Party Favor depicts a fantasia on the popular toy in which a hand-held sculpture collapses when a hidden button is pushed. In Larsen’s version, the subject is a two-headed, political animal with a red elephant’s head on one end and a blue donkey’s head on the other. Each head is, of course, the other’s rear end. Humor and play are not the same thing, but without playfulness there’s no way to get the joke. Plato argues that all works of representational art misrepresent their subjects: that a copy of something real is doubly removed from the idea that inspired the real thing. 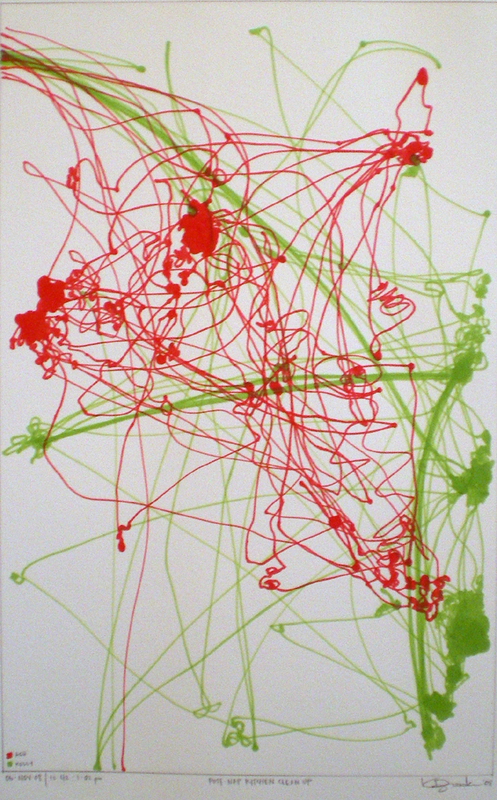 Whether they agree or not, artists who attempt to make copies of visible things undertake one or another strategy aimed at getting as close as possible to thing or idea. Understanding those strategies can help understand and appreciate their larger, further purposes. 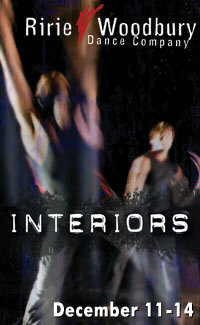 Salt Lake artist Trent Call is collaborating with Charlote Boye-Christensen, Ririe-Woodbury Dance Company's new artistic Director, on Interiors, a new dance piece that will premier in December at The Rose Wagner Performing Arts Center in Salt Lake. Boye-Christensen, a native of Denmark, was appointed Artistic Director for the dance compnay in April 2008. 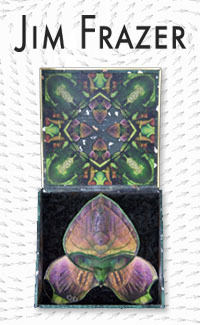 Since she joined Ririe-Woodbury in 2002, Boye-Christensen has created over 18 new works for the company. Trent Call is an artist who combines formal training as an artist (he received a BFA from the University of Utah) with elements drawn from comics and street art. It is a combination that has garnered a lot of attention lately, and ensured that Call's works have been shown in a number of exhibition spaces. 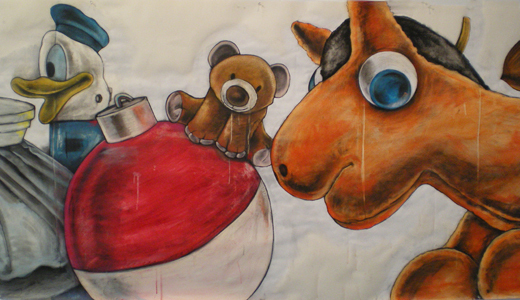 His exhibit, it's a flewk, is currently at the Salt Lake Main Library 4th floor gallery, and he has a few pieces in the SMALL show at Park City's Phoenix Gallery this month. 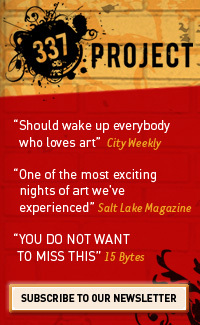 The exterior and interior of the 337 Project building in 2007 featured his spray-paint art; the corresponding documentary, Afterimage, included an interview with him, and his collaborative painting with Sri Whipple, viewed with 3-D glasses, was featured at the Salt Lake Art Center's Present Tense exhibit this summer. Since the Ririe-Woodbury publicity material refers to Call as a "local graffiti writer" I expected to see some of his swinj images when I attended a rehearsal of the piece last month. Interiors incorporates projected images of art by Call, but they are neither graffiti-like (in fact, Call says "I don't write graffiti," which may be a good things since graffiti-writing is considered a felony in Salt Lake), nor the comic-inspired art you might find in his swinj magazine. Instead, a series of video clips and loops, some abstract and others more literal, are projected behind the dancers. I found myself attracted to the more abstract images -- an extremely slow motion close up of a dog's legs walking on wet pavement, a soft close up of leaves rustling outside a screened window. When I attended the rehearsal as a writer for a publication devoted to visual art, I was paying more than the usual attention to the projected images, and as a result found my attention being drawn alternately to the projected images and then to the dancers. The art of the collaboration, though, is about integrating the images with the dance. As Boye-Christensen says, "when you use projected images it's always problematic. You don't want it to be artificially imposed onto the piece. You want to feel that either it functions as a textural background or it adds information to the work." Boye-Christensen feels that Interiors is "an expression of the violent impersonal times that we live in." She chose to work with Call because "his work is completely relevant to what's going on today. He's very much a contemporary expression of contemporary times." 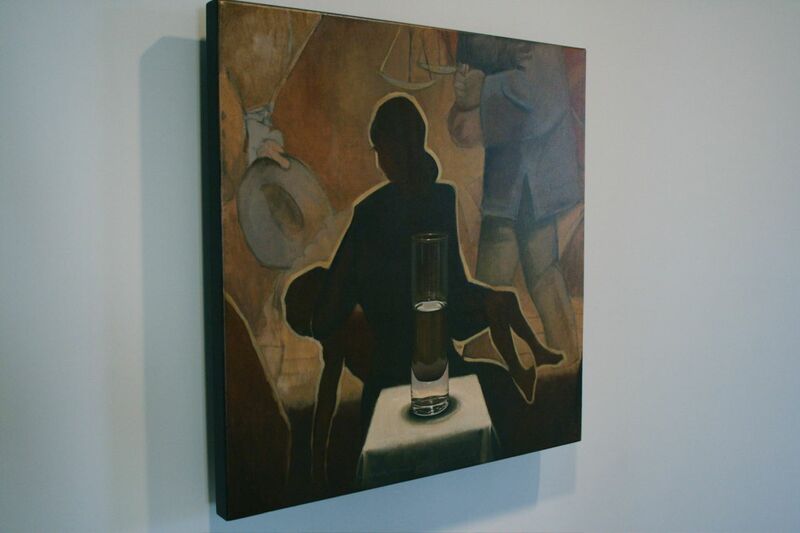 Boye-Christensen challenged Call "to find images that created a specific tone for the work . . . There is a darkness in the work, there is a juxtaposition between the urban landscape and the desert." 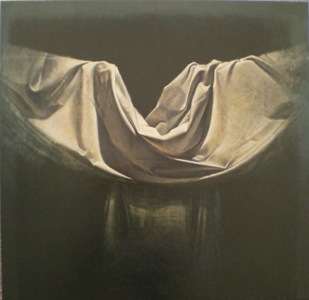 She feels that "the projected images serve as a tonal atmosphere for the piece. 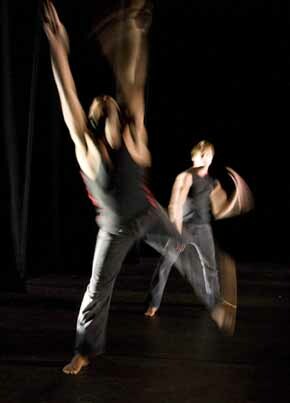 Trent through his images is creating that environment for us to place the dance in." I look forward to seeing the finished piece so that I can see the completed collaboration and allow myself to experience the piece as a whole.